Atlanta's Two Sheds Records has been releasing records mostly from local bands for 10 years now. More importantly, looking at owner John Graham's roster (both past and present), you'll see a list of regional bands who consistently provide superior musical output that isn't limited by genre or even local popularity. 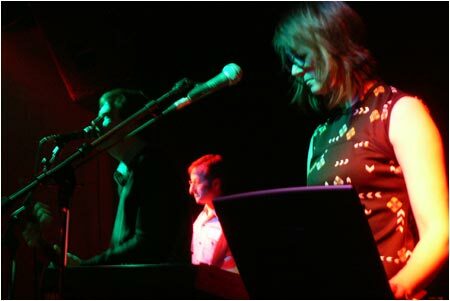 Therefore it is not surprising that at the Two Sheds anniversary show on May 19, the four bands on the bill demonstrated the strength of the label's roster. 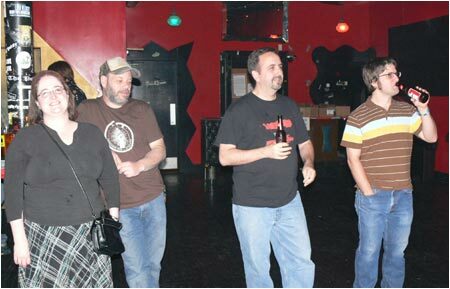 Atlanta Indie Rockers in their natural habitat: The EARL. 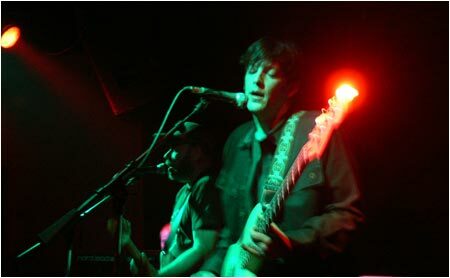 From left to right: Tracers, Ramon Wals, John Graham, Jeff Holt. The first band up was Athens' An Epic At Best, a youngish band whose first album There Will Be Rain impressed me in 2006. I've only seen them live once before, but that was enough to solidify my positive opinion about this 4 piece. On this evening, An Epic At Best impressed yet again as they blew through a short-ish set of alternating piano and guitar driven tunes that had…well… an epic element. Robert Gunn on the piano in An Epic At Best. In particular, frontman Robert's Gunn intense vocals and strong piano melodies soared musically over the backing music and brought to mind the work of The Potomac Accord. 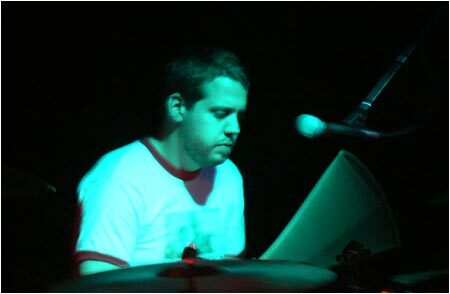 Likewise, the strong, deep drumming of Jamie McGaw provides resonance and counterpoints to the melodies mentioned above. In fact, the only complaint I had through out their entire set was, when Gunn moved to guitar for a few songs, the sound of his instrument completely overwhelmed the other musicians' work. However, that flaw was due more to the mix than any problem with the music itself. 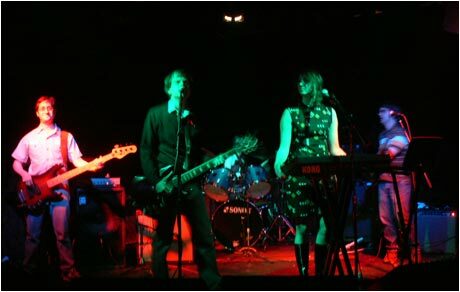 I've heard that this band is due to release a new record later in 2007 and, if their live performances and previous record are anything to go by, it should be one of the highlights of 2007. After An Epic At Best left the stage, Blake Rainey and His Demons set up. In the past, I've had something of a love/hate relationship with Rainey and his solo material. Blake Rainey's hat apparently protects him from His Demons. On this evening, however, I thought they did rather well. 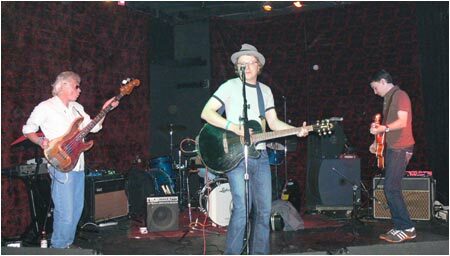 With a relatively stripped down band, Rainey showed off his songwriting skills to their best advantage as he played both old and new material. Without the recorded limitations of his most recent album, Appetizer Sickness, the band sounded more roots rock than singer-songwriter. More importantly, the backing band highlighted the clever simplicity of the music and lyrics, and demonstrated that a fuller sound really works for Rainey. Either way, it was nice to see Rainey musically stretch his legs and move away from the quiet claustrophobia of his previous solo work. I'm always curious to see the third band, The Silent Kids. They haven't released a record since 2003's Tomorrow Waits. But, every time I see one of their infrequent live shows, it appears that they have enough new material to release a new record. The Silent Kids aren't the loudest band, but they're not really silent either. During their set, The Silent Kids seemed as tight as ever as they too ranged through both old and new material. Truth be told, I really like the newer songs, most especially the one about the Soccer Riot (whose name I cannot remember). While the new songs sound much like their earlier work, the new stuff has a tautness that seems less noodly than anything they've done previously. At the very least, it appears that these new songs should translate well to a new album, which will hopefully come out sometime in 2007. I mean, 4 years is long enough to wait, right? The Silent Kids: the view from the laptop. Finally, the evening ended with the Jupiter Watts, who already have anew record out on Two Sheds. 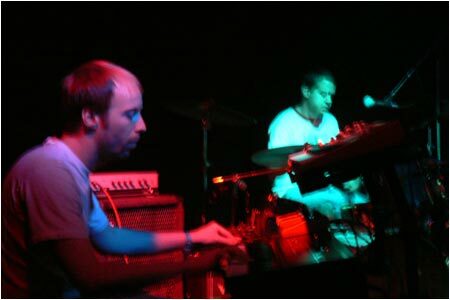 On this evening, the band billed themselves as "remixed", largely on account of the absence of bassist Jared Welsh. Drummer Kevin Wallace pulls double duty when the Jupiter Watts are down a bassist. 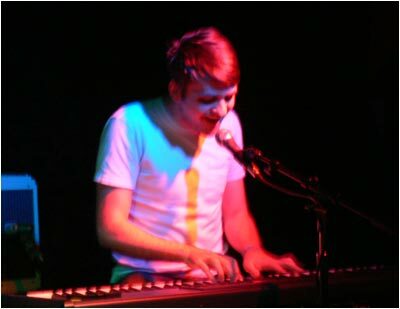 Without his presence, the band appeared to rework some of their songs into slightly different versions. As an example, they played Nothing At All as a half-tempoed lament that suited that song particularly well. Ramon Wals and James Trigg. Likewise, it seemed like they speeded up some of the other, slower songs, as if the band was demonstrating that their songs can work on any number of levels. Finally, they managed to pull off a Neil Young cover, which brought the evening to a successful close. Clay Fowler and Kevin Wallace. This night of music ideally should have demonstrated the strength of Two Sheds' musical roster, and on this account, despite some odd sound mixing, the evening was a definite success. Each of the four bands played exceedingly well and showed off why Two Sheds Records' 10 year anniversary is certainly something to celebrate. Here's hoping the next 10 years of music sound as good.